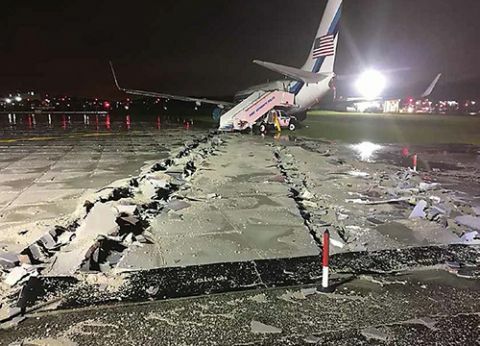 The incident occurred on a dark, rainy evening in late October, when the chartered 737 carrying then-vice presidential candidate Mike Pence and 47 others lost braking control, veered off the side of Runway 22 and ran into one of LGA's four engineered material arresting systems (EMAS). Precisely as it's designed to do, the EMASMAX(r) system stopped the aircraft in its tracks just 300 feet from a major highway, and everyone breathed a quick sigh of relief as first responders sprang into action. LGA closed the airfield as its aircraft rescue and firefighting team and New York City Fire Department personnel accounted for and evacuated Pence, his family and staff, members of the press corps and 11 crewmembers. Airport Operations personnel then transported them off the field. Runway 22 remained closed while response crews tended to the aircraft; but LGA officials were able to reopen the rest of the airfield in about 30 minutes. Runway 22 reopened the next morning. Because the plane was carrying such a high-profile politician, the incident instantly became a top news story. 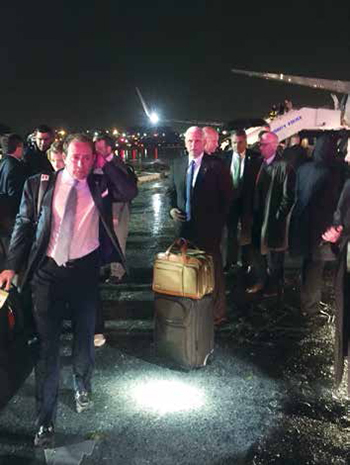 The next day, Pence described the landing to reporters as "10 seconds of uncertainty" and said he felt heavy braking and a bit of fishtailing after the plane touched down. "With mud splattered up on the windows, we figured we were up off the runway, but thank God everyone was fine," said President Trump's running mate. Officials from the Port Authority of New York and New Jersey (the entity that operates LGA and four other area airports) were also thankful that everyone escaped injury and the plane sustained no structural damage. "The response by airport staff and mutual aid providers went as planned, and our personnel were trained," says Tom Bock, manager of Regulatory and Operational Support for the authority's Aviation Department. "The Port Authority hosts several emergency response drills throughout the year at each of its facilities, including all of the airports." Bock also highlights the role that the airport's EMAS played in the successful outcome. "Had it not been for the arrestor beds, this could have been a far more serious incident," he notes. EMASMAX(r), from Zodiac Arresting Systems, is 150-foot wide system of lightweight, various height cellular cement blocks that crush when an aircraft rolls over them. While many people heard Pence's personal account of the dramatic landing in the news, few know much more about the incident. Of the several thousand blocks that make up the airport's EMAS, only about 130 were affected when the aircraft veered off the runway, explains Kevin Quan, vice president of Sales and Marketing for Zodiac. "It was a small percentage of the overall system that needed to be repaired, which is good," says Quan. Zodiac's post-incident support began the very night of the overrun, with personnel answering technical questions and advising crews about removing the aircraft from the EMAS bed. Assessing damage to the safety system itself was also a pressing matter, and crews gained access to the site the following day to do so. Because the Port Authority wanted the runway's EMAS back in service as quickly as possible, it cleared the Zodiac team to start repairs on Saturday evening, just two days after the overrun. Crews were allowed to work on the runway from midnight until 5 a.m., and they finished in two shifts, completing the job Sunday night. By Monday morning, the EMAS was fully functional and operating as usual. Quan says the repairs at LGA were the quickest Zodiac has ever performed; and it helped that the company has a corporate location nearby, in Logan Township, NY. "We make blocks every day as a continuous manufacturing facility," notes Quan. "We actually stock the blocks that can be used for emergency situations like this one." Having replacement materials on hand is key, because just one busted block renders an EMAS inoperable and immobilizes traffic, he explains. Although the undamaged blocks remain functional and the odds of another plane landing in the exact same damaged spot are low, the FAA requires 100% of the system to be fully functional. Usually when an EMAS is damaged during a runway overrun or veer off, the insurance carrier for the aircraft owner/operator becomes involved with the repair schedule. At LGA, however, the Port Authority paid for repair work upfront and addressed insurance issues later so it could accelerate the repair process to expedite reopening the runway. This was only possible because the Port Authority had a pre-existing agreement already in place with Zodiac, Quan notes. He emphasizes that it's important to have a contract that addresses emergency situations, the need for fast repairs and what each party can expect in such circumstances. "You certainly don't want to have these things delayed because of contractual issues," he explains. "It all depends on the airport: how big it is and how the executives want to operate. Some don't want to go through all the red tape." The Port Authority's agreement with Zodiac also includes a schedule for ongoing maintenance, including regular inspections and provisions for small, less urgent repairs as needed. "If an airport owner has EMAS, they should have some agreement in place that allows quick repairs," he advises. "With this specific case, we did the assessment and then turned around a quote very quickly to the airport to make sure they were OK with it." Bock notes that the EMAS was repaired and fully functional within two days-crucial speed given LGA's heavy traffic. With a total of 11 EMAS installed at its various airports, the Port Authority is a veteran of the runway safety technology. In fact, Zodiac's first EMAS prototype was installed at John F. Kennedy International Airport (JFK) in 1996, and the Port Authority helped the company develop the system to what it is today. In retrospect, Bock applauds LGA management, and the Port Authority as a whole, for spearheading what he considers a major safety enhancement for aviation. "We have seen proof that it is not only effective, but has saved so many lives," he reflects. Quan notes that the Port Authority's long history with Zodiac helped recovery efforts run smoothly after LGA's high-profile incident on Runway 22. "We've done this before, and, actually, the Port Authority has, too," he comments, noting that the October incident at LGA was the Port Authority's fourth experience with aircraft entering an EMAS. This was LGA's first; three others have occurred at JFK. Overall, Zodiac has installed its EMAS systems in 68 airports around the world, and this was the product's 11th save. "Eleven for eleven," notes Quan. "We've really seen a lot in the development of the technology and the industry embrace it. It certainly has a lot to do with the fact that it's worked every single time." EMASMAX(r) is ideal for runways that do not, or are unable to have, runway safety areas because it doesn't rely on aircraft braking to stop overruns or veer offs, he explains. Aircraft roll right through the bed and are stopped as they crush the blocks. "I call it a superior system compared to just a regular paved area," Quan says. "A paved area still relies on friction, braking to stop an airplane. This really takes that uncertainty away." Each system is customized for the specific aircraft that use the associated runway, he adds. Landing gear and where various aircraft would run into the EMAS are crucial factors. "We go through a design process to make sure it's the right configuration of materials, which takes a lot of time and effort with the airport and FAA in designing the optimal solution," he comments. Quan, who has been with Zodiac for 14 years, gives Port Authority personnel a lot of credit for trusting EMAS technology, believing in Zodiac's system and helping the company develop its product. "They were pioneers in adopting new technology, and it's nice to see how they've reaped the benefits over the years," he reflects. One important product refinement was making the blocks more resistant to jet blast, so they can be placed closer to the runway. Bock agrees that the Port Authority has a good relationship with Zodiac, noting that the two organizations have worked together on EMAS projects since the beginning. "They are a reliable partner," he remarks. "The night of the incident, our maintenance staff was able to do the initial cleanup of the damaged EMAS blocks, but we needed Zodiac to handle the repairs. They quickly mobilized and sent a team to the airport to handle the repairs of the damaged blocks."